MUA Makeup Academy Undress Me Too Eyeshadow Palette: Worth the hype? By now, I am sure you have read gazillions of reviews about MUA Undress me Too Palette. It has been raved, lusted, reviewed, called the dupe of Urban Decay's Naked 2, budget beauty's Naked 2 and what not. A year or two ago, when I first started falling in love with earth colors which not only fit in for my profession, but also, go perfectly with my bright lip colors, I wanted to lay my hands on some some inexpensive palettes to begin with. huge order from MUA as well. Ihave been much using it, yet, I don't know why I never felt like reviewing it. is that because I am not too impressed? read on. Let me begin by saying that the finish of the shadows are a mix of mattes and satins. The colors do have fall outs. Not all of them are equally pigmented. The satin-finish ones are quite pigmented, while the mattes are just all right. The strange thing about this palette is that, even the colors which are fairly pigmented, do not show on swatching with fingers, but work well with a brush. That is, on finger-swatches, they don't reveal their colors. LOL. MUA Undress Me Too Palette: The six colors on the right. 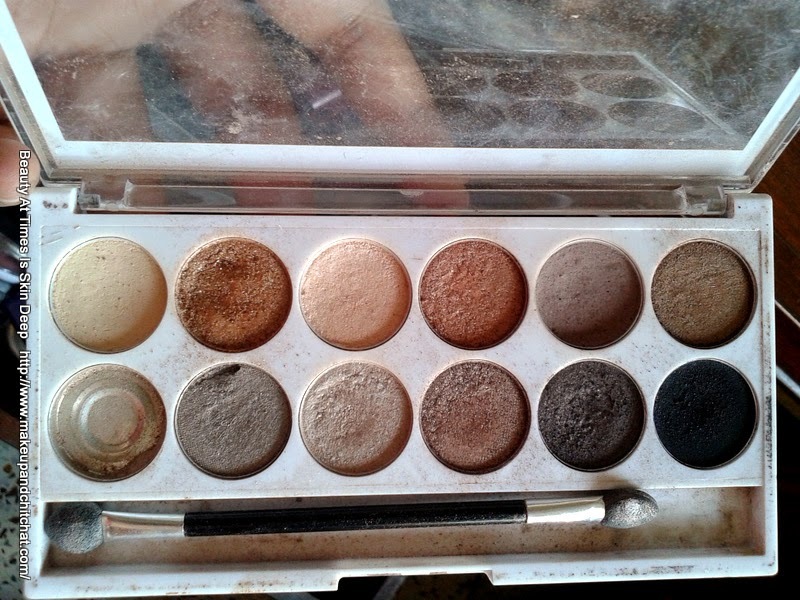 That being said, it is one of my most used palettes. I use it almost regularly, and I am hoping to actually use this one up. I also have their Heaven and Earth Palette which I feel, works better in terms of quality. In a slightly different light. Verdict: Though it is one of my most used palettes ( as you can already see), I think, if you are in the UK, you have better options. Even in India, with e-stores popping up everyday, we really have good alternatives. I mean, in India, the length one has to go to get hold of this palette, is not really worthwhile. Even at 4 GBP, I would not really recommend this one. Shall I repurchase? No. I have already found better options. What's your take on the MUA Palette? I would like to know.